Yesterday I shared this page that I created to document my obsession with tea, which is only fuelled at this time of year by the availability of delicious Christmas teas. If you're familiar with my style, you might know that I like to journal a lot, and that yesterday's page really didn't have much journaling space. 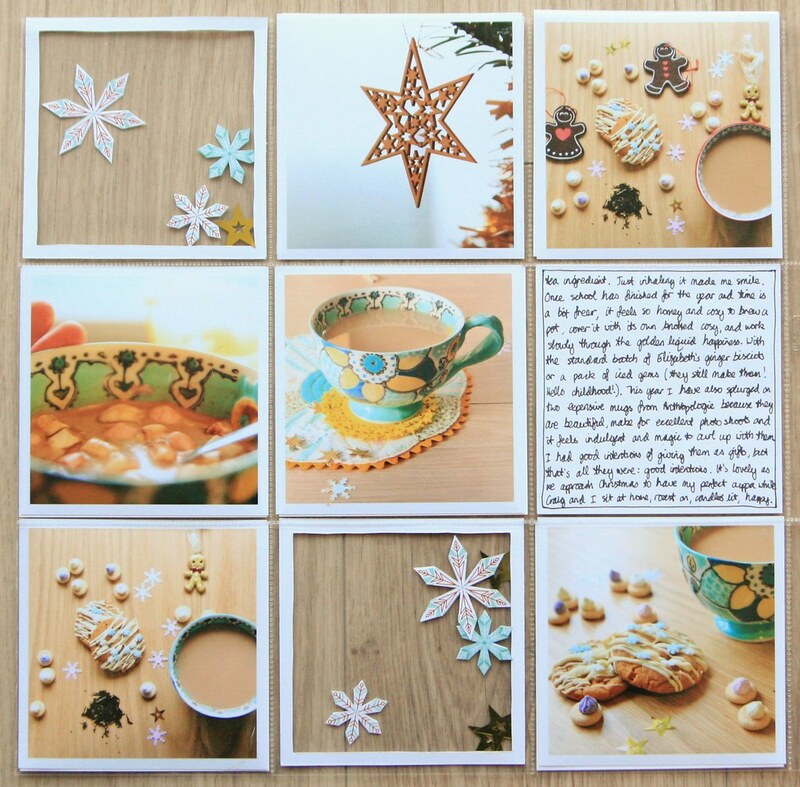 Similarly, I took loads of tea-based pictures last Christmas and yet I only used one of them on the page. Well fear not scrapbookers, because yesterday's page was only half the story; you can find full details of that layout here, and today I'm sharing the pocket page that goes alongside! 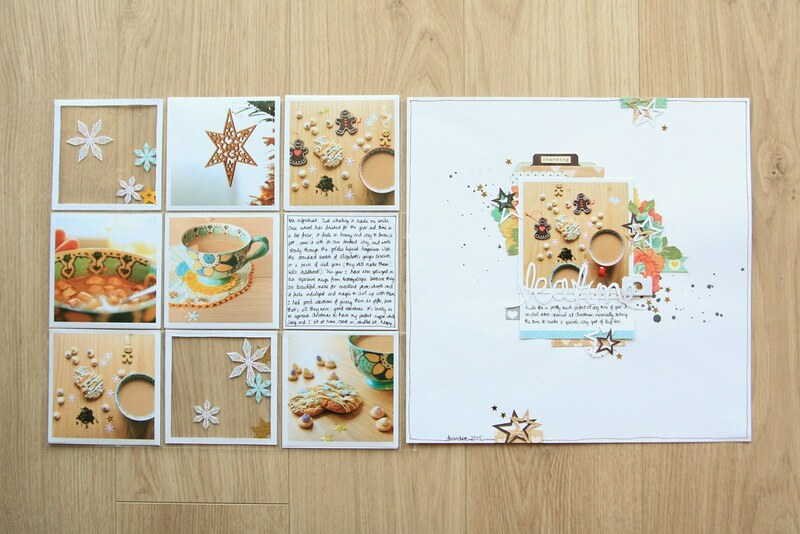 Recently, I have been making a pocket page quite often to accompany a scrapbook layout. This has mainly come about because I take a lot of photos and I've invested quite a lot of time learning how to take pictures that I love. But given that my scrapbooking style and preference is usually based around one photo, the consequence is that the majority of those photos never make it into my album. Pocket pages have allowed me to change that, but still scrapbook in the way that suits me best. In November, I ordered lots of my Christmas pictures from last year to be printed by photo company Cheerz. I've used them a few times and I love their square prints in particular. I've been really pleased with the quality of the images that come back; I always upload my photos to their site from my computer rather than using my phone, but that's because I take photos almost exclusively on my dSLR. The pictures also arrive pretty quickly, and come presented in a lovely box that's also great to store them in. I've ordered the Big Fat Box a couple of times, and I can get tons of prints in there. Having these Christmas pictures printed and ready to go has made it very simple to put together a divided page to match a layout. I always opt to have them printed with a white border, because I both like the look, and I think it ties the pictures together well to form a set. I've stuck to square pictures as it's a size I like, and so picked up a pack of 12x12 pocket pages with space for nine 4x4 photos. Then I slot in the pictures I want to accompany the scrapbook page. I spread my pictures out and decided to fill the other pockets with little embellishments. I cut a white cardstock border to go in each empty pocket as a frame so that they would match the photos and make the design seem cohesive. Then all I added were some gold sequin stars and snowflakes cut from patterned paper from Shimelle's Christmas Magic collection. 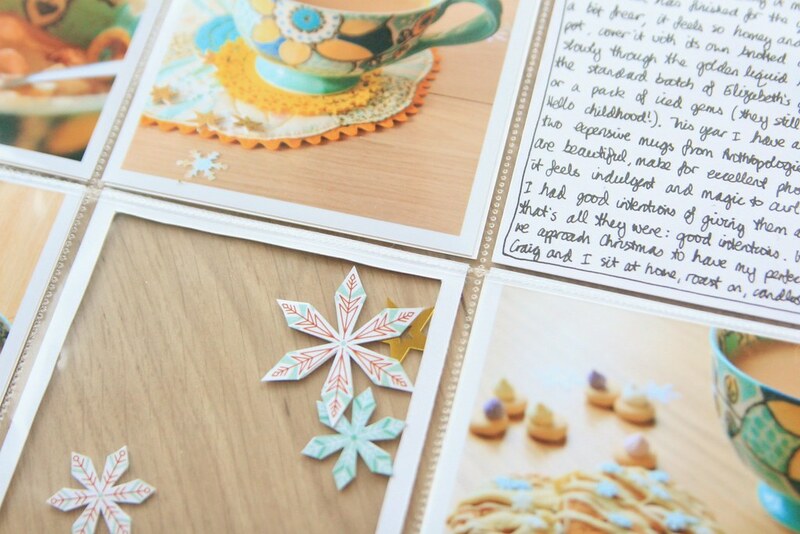 The stars are a good linking element with the scrapbook page, and the snowflakes just seemed festive to me! For each snowflake, I cut out two of the same pattern and stuck them back to back as this divided page protector will eventually have another set of pictures on the reverse to match another page. This way, everything is versatile and double-sided! By contrast, I haven't embellished my photos at all as I don't think they need it. They look clean and uncluttered, and any detail I wanted to include is either in the empty pockets or on the full scrapbook layout. 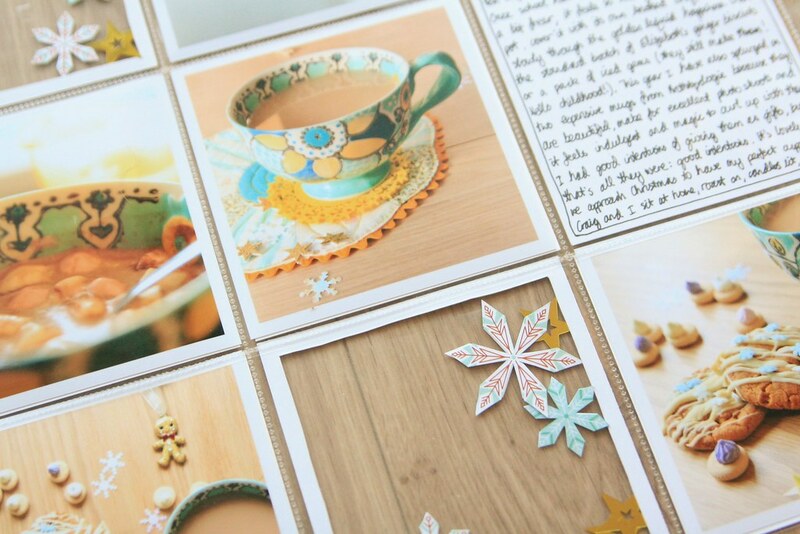 Perhaps adding embellishment to the photos is something to try in the future? In my opinion, the other big plus when it comes to using divided page protectors is the extra journaling space. I have no problem including loads on my pages (I always have plenty to say!) but knowing there is going to be lots of space in a pocket page to get all my thoughts down, means that I don't need to think about creatively finding more journaling room on the scrapbook layout. I can concentrate on the design knowing my story is going to be told in full. Having said that, I will always include some journaling on a layout even when there is an accompanying pocket page, because I like the look of handwriting. 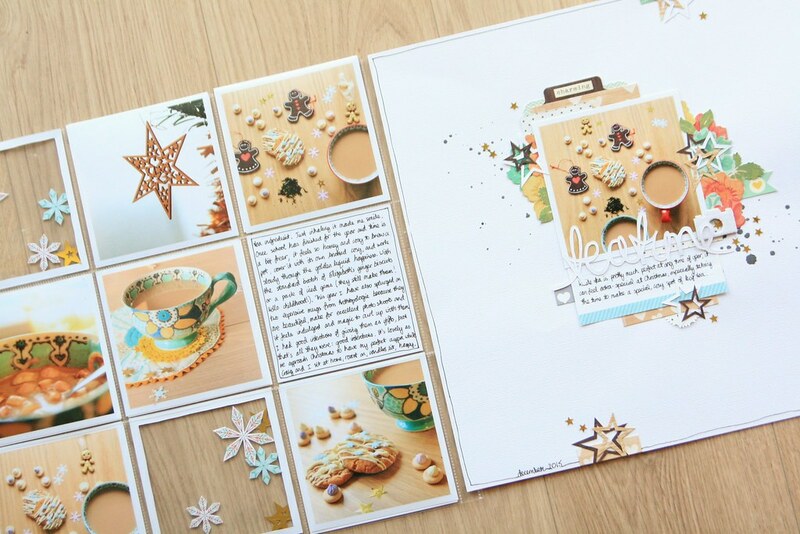 I'm really pleased with how this spread turned out and think it will be nice addition to my Christmas album. And while I will never be a project-lifer, I am certainly prepared to embrace the pocket page and its photo-holding capacity! I love how the two look side-by-side, and will be pinching this idea very soon! Thanks! I love how it turned out and I'll be doing it again soon! I loved you travel pocket pages, it was amazing how you made everything match and this one in the same style is also lovely (and the colors taken from photos? double the lovely). I wonder what you'll put on the other side and what will pick through those clear pockets.